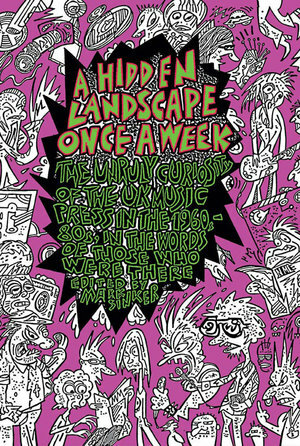 Excerpted from A Hidden Landscape Once a Week: The Unruly Curiosity of the UK Music Press in the 1960s-80s, in the Words of Those Who Were There, edited by Mark Sinker. Copyright © 2019 Strange Attractor Press, 2019. Distributed by The MIT Press. Excerpted by permission of MIT Press. All rights reserved. No part of this excerpt may be reproduced or reprinted without permission in writing from the publisher. "The Look is as Important as the Noise"
Tony Stewart recalls his time as writer and deputy editor at NME (1971-85) — the strengths and pleasures of teamwork and the vital role of the visual in the energies of a rock paper. The week that I had my first-ever byline piece printed in the British music press – a review for the fledgling weekly Sounds of ELP at Birmingham Town Hall, published on 31 October, 1970 – could only be described as bizarre, even in the surreal world of print journalism. Because elsewhere I was writing about the difficulties of opening a public sauna in Burton Trent, Staffordshire (because of "the shocking condition of the building"), the monthly meetings of Stretton and Yoxall Parish Council, market prices (not city but fruit and veg – pomegranates at 6d and a Cos lettuce for 1s 4d etc), and the funeral of a prominent local business and sportsman who'd croaked in hospital after that delicate and unspoken "long illness". Such was life for an indentured cub reporter on local evening paper the Burton Daily Mail, albeit a reporter with ambitions to enter the glamorous and giddy world of the rock press, a reporter who was determined to put into practice the advice of his English teacher Eric Taylor. "Another outlet for writing," Eric wrote to me on leaving school, "would be for you to become a specialist in a particular field. You might for example choose Pop as you already know something about it… Even the stars of the Pop world need constant publicity to keep them in the public eye and they will rarely refuse a request for an interview made by a journalist." Half a century later, those words may seem a little naive, but they were well meaning. Secondary-school teacher Eric, a former professional footballer, had a lucrative sideline as a health and fitness writer, and he also knew I played drums in various rock bands. How was he to know that between the journalist and the stars was the often impregnable barrier of a publicity machine, ferociously controlling who could or couldn't talk to their charges? And this Burton Daily Mail reporter who moonlighted as a stringer writing gig reviews for a collection of music papers – "the lowliest foot soldier" – certainly had no idea of that, either. So when then-assistant editor of New Musical Express John Wells rang me in 1971 and asked if I could get an interview with Steve Winwood of Traffic — who were playing at the Belfry, Sutton Coldfield, on their 'Welcome To The Canteen' tour — I didn't see a problem. I went straight to the artist, bagged what is commonly known as a "front-page scoop", and was consequently offered a staff job on NME. It really was that easy. I started in September that year, moving from Burton to London with my small collection of vinyl albums and few belongings. I slept in the back of my car, on people's sofas or in their spare rooms for a few weeks… And never looked back. For the next 14 years I would be intimately involved in one of the most defining and turbulent periods of the British music press. For me they were golden years. In the early 70s, a collection of mismatched writers from different backgrounds with a passion for music came together in a bustling office in London's Covent Garden, fusing into a formidable team under the banner New Musical Express. I was probably one of then-editor Andy Gray's last recruits, joining an editorial team which included Nick Logan, Roy Carr, Derek Johnson, Julie Webb, Richard Green, James Johnson and staff photographer Robert Ellis. Gray would soon be axed to make way for the brash, no-nonsense Alan Smith, who had only months… weeks… hours – depending on who you believe – to save an ailing NME. Once the definitive pop paper of the 1960s, enthusiastically covering every chart act from Cliff and Elvis to the Beatles and the Rolling Stones, by the turn of the 70s it had lost touch with a burgeoning, more serious music scene. Since 1967 there had been cataclysmic changes. In America, the Monterey International Pop Festival had featured the likes of Jefferson Airplane, Grateful Dead, Jimi Hendrix and Big Brother and the Holding Company (singer Janis Joplin). British music had seen the release of the Beatles' Sgt Pepper's Lonely Hearts Club Band, the Jimi Hendrix Experience's Axis: Bold As Love, Pink Floyd's Piper At The Gates Of Dawn, the Moody Blues' Days Of Future Passed and Traffic's Mr Fantasy – to name just five seminal albums. It was famously known as the psychedelic era – or sometimes 'progressive rock', at that time still an accolade. 1969 saw the Woodstock Festival. The following year in Britain there was the Bath Festival of Blues and Progressive Music in June, and the Isle Of Wight Festival in August. Together they presented a rollcall of influential acts, including the Doors, Leonard Cohen, Chicago, Miles Davis, Joan Baez, Ten Years After, ELP, Jethro Tull, Santana, Dr John, Frank Zappa, the Who and Pentangle. Three-minute pop ditties, trilled by fragrant girls and clean-cut, well-groomed boys, slick as a lick of Brylcreem, seemed to have succumbed to the unkempt and great unwashed, swept in on long, intricate improvisational suites fuelled by hash and acid. But that blend of music and narcotics had largely failed to captivate NME, and in 1971 it was an embarrassing mishmash of musical genres, showbiz and pop pap alongside ineffectual flirtations with this more heady and serious music. It was certainly no match for Melody Maker, which had willingly embraced these changes. The market-leader had authority as well as a team of eloquent and entertaining writers, particularly their lethal duo of Michael Watts and Roy Hollingworth, as well as the cheery and avuncular Chris Welch. They had a gift for writing about exactly the right acts. There was also Sounds. Launched in October 1970 by two former Melody Maker stalwarts — Jack Hutton and Peter Wilkinson — it was a young and refreshing voice, with an exuberant and talented team of writers, in what was becoming a vibrant and competitive weekly market. But Smith was about to revive NME's fortunes, along with his genius of an assistant editor Nick Logan. While Smith was an astute businessman who could deal with the commercial management of the paper and the vast profits it made for owners IPC, Logan was the creative eye, with a strong passion for words, photographs and layout. Succeeding Alan in 1973, he went on to become one of the paper's most successful editors, before leaving to conceive such seminal titles as Smash Hits (1978), The Face (1980) and Arena (1986). In a matter of months, NME was a roaring success, recruiting from the underground press a Californian hippy called Danny Holloway, the infamous duo of Charles Shaar Murray and Nick Kent, and Mick Farren. With those writers came new photographers – most notably the reserved and thoughtful Pennie Smith and Joe 'Captain Snaps' Stevens, a garrulous American. Over the next few years, this motley crew were bonded by a team of creative, innovative, visionary, subversive and sometimes demented editors – including ex-military man and musician Tony Tyler and Cambridge drop-out and sometime songwriter Ian MacDonald. Tony T and Ian Mac were both fiercely intelligent, with very wide cultural tastes and a wicked sense of humour and mischief. Formerly editor of Beat Instrumental and publicist for ELP, Tony had a sharp eye for talent both musical and journalistic. He was an early champion of Roxy Music and Dr Feelgood and played a significant part in hiring Nick Kent, Neil Spencer, Tony Parsons, Julie Burchill, Paul Morley, Vivien Goldman and Paul Du Noyer. He once had two radically different books in the New York Times best-seller lists at the same time, The Beatles: An Illustrated Record (1975) – a collaboration with NME colleague Roy Carr – and The Tolkien Companion (1976). He also wrote I Hate Rock And Roll (1984). Ian, who I worked more closely with, was probably the more academic. He briefly went to Cambridge but dropped out after a year. He too would later write two strikingly different books – one a controversial study of the classical Russian composer, The New Shostakovich (1990), the other the highly-regarded Revolution In The Head: The Beatles' Records And The Sixties (1994). Sadly both had untimely deaths. Ian took his own life in August 2003, aged 54. Tony died of cancer on 28 October 2006, aged 62. Like Smith and Logan and others, I had a background in local journalism. CSM and Kent by contrast arrived with an electrifying writing style inspired by the New Journalism of Tom Wolfe and Norman Mailer, as well as publications like Rolling Stone, Cream, Oz, Friends aka Frendz, US comics, hardboiled crime fiction and the unconventional generally, a terrain people called the 'counterculture'. They were aficionados of the cool and cutting-edge in music – Bowie, Bolan, Elton John, the Rolling Stones, Roxy Music, Iggy, Lou Reed, the Velvets, Captain Beefheart, the New York Dolls… They quickly became the star writers and the personality of the paper, barrelled along by the madcap irreverence and humour of Tyler and MacDonald. There was some praise, though. In July 1972 I wrote the first of a two-part story on Roy Wood leaving ELO to form Wizzard under the headline, 'Did He Fall Or Was He Pushed? ', which Alan Smith told me was "as good as anything that appeared in Rolling Stone" — serious praise indeed. Wood's manager, the notoriously aggressive Don Arden (and father of Sharon Osbourne), took exception to the piece and turned up at the NME offices, berating me as a pox-addled, alcoholic junkie, and threatening me with serious physical harm. He also banned NME from ever mentioning his artistes again. Printed in the following issue, the second part of the feature was less, ahem, controversial — as Alan had asked me to be a little more diplomatic. But it was only years later that I read the following observation from Tony Tyler, in Paul Gorman's excellent In Their Own Write: Adventures In The Music Press (2001), and realised that my approach wasn't as unappreciated as I'd imagined: "Perhaps the hardest job in rock writing is the interview," Tony T said, "and the best interviewer on the NME in my day was Tony Stewart, later editor of Sounds. He was so quiet and unforthcoming in interviews that his subjects would babble their heads off out of sheer nervousness, giving him great material to work on." Probably my most notorious interview was with Queen's Freddie Mercury, in the edition of 18 June 1977 — as much for the headline and pull-out quotes Ian Mac put on it. 'Is This Man A Prat?' is one of those legendary headlines that is more famous than the article (as is Tony T's, alongside a picture of Bryan Ferry wearing South American dress in 1974: 'How Gauche can a Gaucho get?') But as punk's musical anarchy was sweeping the UK, 'babbling' Freddie wanted "to take ballet to the masses". With me on that assignment was Pennie Smith, who had an easygoing manner and could be completely unobtrusive as she snapped away, capturing crucial, unguarded moments. Not particularly technical, Pennie had a raw, artistic, bleached black-and-white reportage style that reprinted brilliantly on the shoddy newsprint of NME. Her picture of Paul Simonon of the Clash smashing up his bass on stage in 1979 would grace the cover of their London Calling album — and, in 2010, a Royal Mail First Class postage stamp. But there are many others – from Led Zeppelin to the Stone Roses. The photographers at NME should never be under-estimated. If the writers signposted the way to the soundtrack of a generation, the photographers provided the showreel. Pennie and Joe Stevens – and later Chalkie Davies – were visual pioneers who'd go on to form legendary teams, the former with Nick Kent, the latter with Charles Shaar Murray. In contrast to Pennie, Joe was an ebullient New Yorker who talked his subjects into his lens. He was an untutored, natural force of nature. Together they brought the paper a style and unique look, which combined with inventive layouts had tremendous visual impact. Logan was a superb magazine designer, with a gift for headline-writing that drew readers in. But what I learned from Ian Mac in particular was the idea of a writer and photographer working as a team with a commissioning editor, a kind of triumvirate. He was my editor and we did some bizarre features including Lulu and Dorothy Squires. His excitement and enthusiasm were inspiring and contagious. I owe Logan, Ian Mac and Tony T an enormous debt for their inspiration and whatever success I enjoyed in the music press. In the late 70s, encouraged by deputy editor Phil McNeill and Logan's successor as editor Neil Spencer, I moved over to the commissioning and production side, when it was discovered I had an eye for design. I ended up working on countless covers and major features. But with such talented photographers as Anton Corbijn, Kevin Cummins and Peter Anderson — to name just three— the task was a delight. They would continue the tradition established particularly by Pennie Smith, with their images defining the look of NME into the 1980s. Anton is probably the most celebrated, not least for his work with U2. He was the master of the black-and-white photograph, which was heavily stylised and theatrical. He once told me that he created the photograph's atmosphere in the dark room, working on the light and shade as he developed the image. Many are striking works of art. One of his most famous is Captain Beefheart shot in the Mojave Desert in 1980, holding his hat in his hand as he peers into the lens. Pennie Smith thought it very similar to her classic shot of Mick Jones used on the cover of her 1980 book, The Clash: Before And After. It is. But then Anton probably felt Kevin Cummins' style could have been inspired by his own. Maybe it was. "The fact that I was there for many defining rock'n'roll moments is a great testimony to the power back then of the NME," Kevin wrote in the introduction of his excellent Manchester: Looking For The Light Through The Pouring Rain, a revelatory 2009 compendium of his work, featuring Joy Division, New Order, The Smiths and Stone Roses: "Rock'n roll photography has been unfairly denigrated over the past few years. Many art critics dismiss it as juvenilia. However in my opinion the way we perceive our bands is often formed by the images we remember of them." In contrast to Anton and Kevin, Peter Anderson was a raw and spontaneous photographer, with a powerful energy dominating his work. Like Joe Stevens, Peter was the captain of the snap, rattling off frame after frame, and capturing the moment. Even so, he also delivered beautifully composed cover shots time after time – and it was this versatility which made me invite him to come to Sounds with me. Rock photographers — Anton and Peter in particular— were the inspiration for my book in 1981, Cool Cats: 25 Years Of Rock 'N' Roll Style, a collection of images and essays. As I wrote in the introduction, 'Putting On The Style': "Rock 'n' roll is a visual culture. The look is just as important as the noise." Appropriately enough, the 60s chapter, 'The Total Look', was written by Paul Weller, an artist well aware of image and the power of photography. One of my most memorable experiences at NME was designing the cover for the 1982 Christmas double issue, with an exclusive Weller interview to mark the end of the Jam (my last major feature for NME). He decided he wanted to dress as John Steed from the TV show The Avengers, with a bowler hat, brolly and city slicker suit, and the session was artistically shot by Peter Anderson in colour. With the coverline 'The Gentleman Mod Comes Clean', it worked well. Perhaps less illustrious with hindsight, one of my final NME covers and concepts, from May 1985, had the headline 'Watching The Detectives'. Heavily disguised, I modelled as a private investigator watching his victims, shot at night by Peter again. It was a moody, atmospheric and smoky image that tied together two major features – Gavin Martin's 'The Elmore Leonard'. Aside from a title that adopted the name of a famous Elvis Costello song, this hadn't much to do with a music mag, as I now see – but everything to do with a youth culture paper. Tony Stewart was a writer with and later the deputy editor of NME in the 70s and 80s, then editor of Sounds from July 1985. He was creator and launch editor of Select (1990), managing editor of Rage (1991), and assistant editor and columnist at the Daily Mirror (1992-2014).